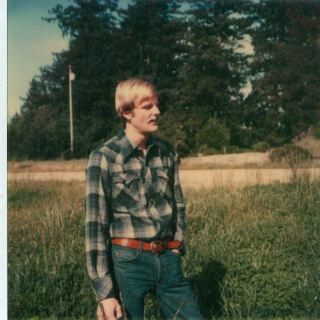 (Photo: Jim Wickett, John’s son–posing on the Skyline property, about 1980). John Wickett’s son, Jim, wasn’t kidding when he told his dad it was time for a change on the Skyline property. “Things have gone too far here,” he said. In the meantime, Jim, who was studying for a law degree–which his father believed would be useful when dealing with the county district attorney–was elected president of the Skyline Improvement Association. The deputy sheriff’s badly which he now carried “gave him a little more control over the outsiders,” explained John. Jim became active with the Kings Mountain Fire District. A fire truck was parked on the property in return for maintaining it. Eventually most of the land was sold off–and by 1979 the Wicketts owned about 500 of the original 4,400 acres.